Vishay Intertechnology, Inc. today announced that the company has extended its T55 series of vPolyTan™ surface-mount polymer tantalum molded chip capacitors with new devices in the Z case (EIA 7343-19) size. 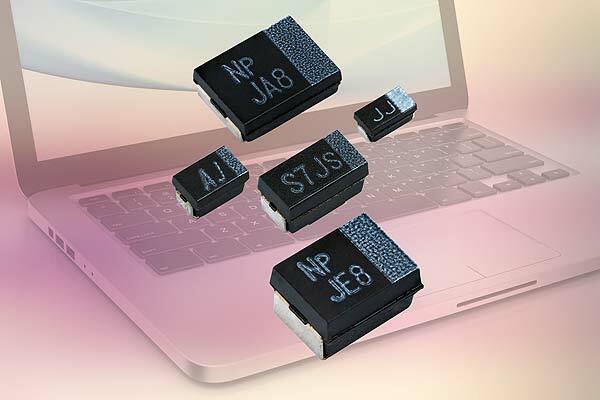 Offered in the compact J, P, A, B, T (low-profile B — 1.2 mm max), D, V, and Z case sizes, the T55 series features a wide capacitance range from 3.3 µF to 680 µF over voltage ratings from 2.5 V to 63 V, and a capacitance tolerance of ± 20 %. The capacitors provide ultra low ESR from 500 mΩ down to 7 mΩ at +25 °C, a result of their polymer cathodes, which offer greatly enhanced performance over manganese dioxide devices. Capacitance values up to 1000 µF and ESR values down to 6 mΩ are in development.